Goldner's Top Dog is owned and operated by Doug and Linda Goldner. Linda is passionate about all things furry. Learning to groom as a young girl, caring for her own dogs first, as well as the assortment of livestock including Angora Goats and Angora Rabbits that were kept so she could spin their wool. Linda also studied as veterinary technician in the early 1980's, but is much happier just grooming and loving dogs and kitties. She apprenticed and took grooming courses, and still attends many seminars every year to keep abreast of new information and trends in the pet world. Doug is a natural around dogs, growing up with an Old English Sheep Dog. Dogs are just attracted to his calm, quiet ways. Together in 2001, they established Goldner's Top Dog. 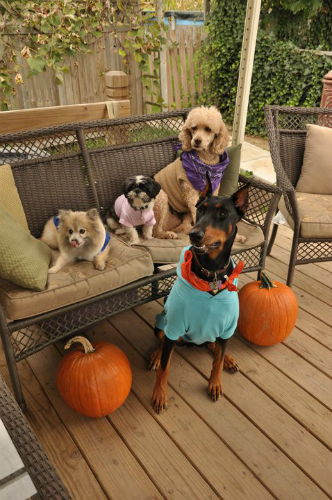 ​The Goldner's own three dogs; Ming-Ming a Shih Tzu, Danika a Doberman and Scarlet a Standard Poodle that Linda enjoys trying new styles on. Nicky, our Pomeranian left us January 8th 2014 at the age of 17 years old. R.I.P.